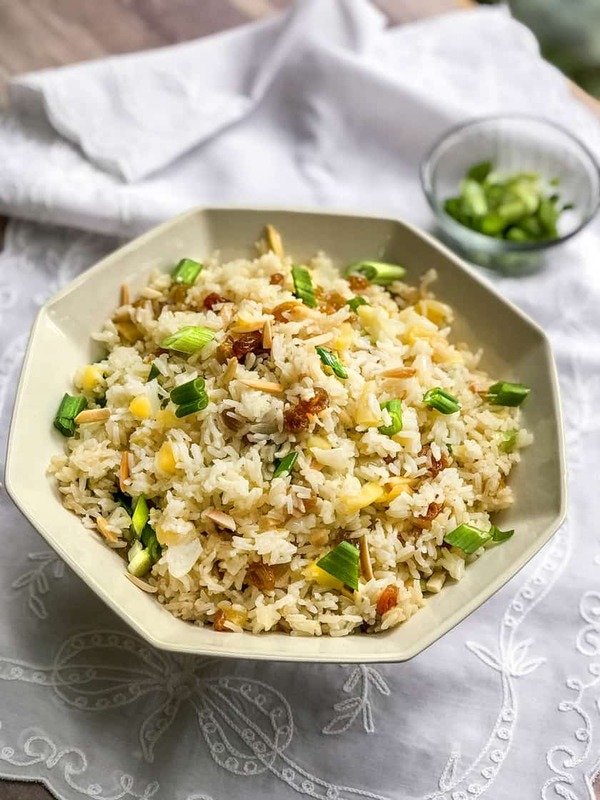 While this favorite tradition has been cooked many ways in our house, this Fruited Rice Pilaf recipe is still standing the test of time. 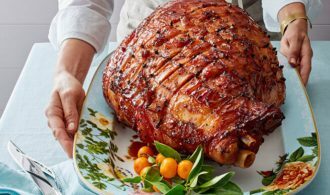 Always an anticipated dish on our Easter table. Sometimes, Christmas too. 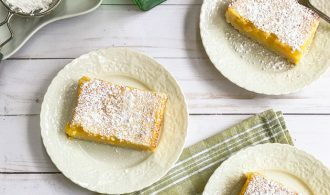 It’s fragrant with warm spices, soft and fruity, and crunchy with toasted almonds. It is a scrumptious favorite. Before we get to the recipe, can we talk about the bowl this dish is in? It’s part of the tradition. It’s funny how pottery, china, and dishes can do that. Be part of the tradition! This octagon shaped bowl makes an appearance on most of our holidays throughout the year. But most especially when it’s time for Fruited Rice Pilaf. And it has a childhood history for me. The bowl is a part of a set my mother bought years ago at The Pottery Shack in Laguna Beach, California. A beachy, shacky, outdoor spread that fascinated me with its colors and textures. It’s rambling rooms. My mother would spend hours there as it wasn’t too far from our home. Created in 1936, this “Shack” survived for 66 years before some bumpy roads led to its eventual dead end. A new shop has opened in its ruins called The Old Pottery Place. Ok — thank you for that walk down memory lane. Let’s get back to the food! 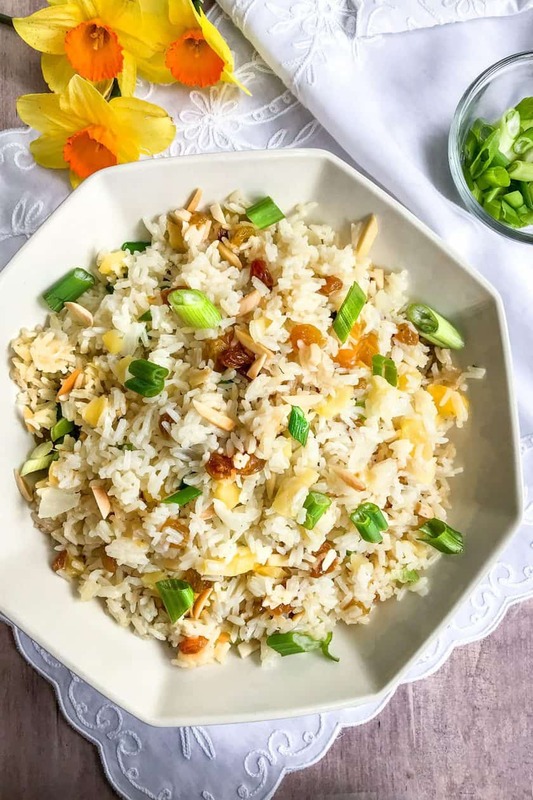 This Fruited Rice Pilaf. Oh, my, goodness… you’re going to love this dish. 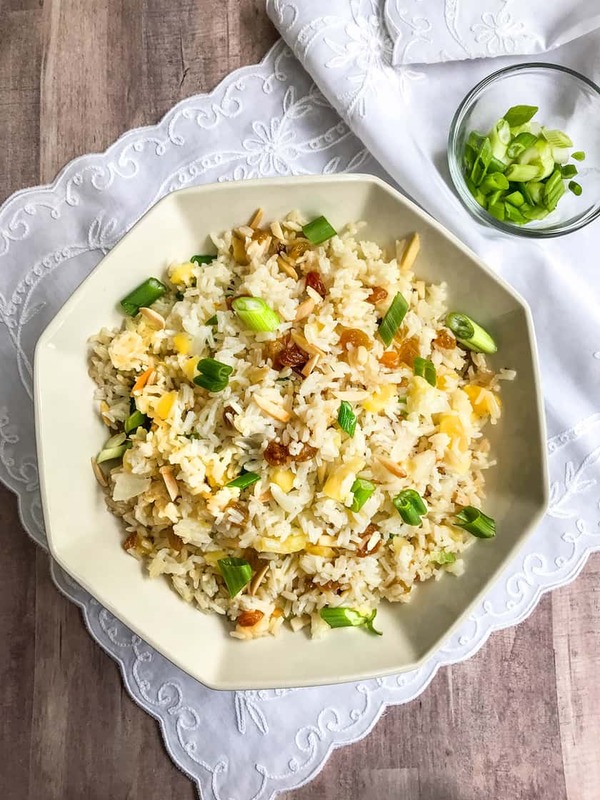 Inspired by Marlene Sorosky’s “Year Round Holiday Cookbook,” tweaked here and there, and eventually converted to an Instant Pot recipe, this rice couldn’t be easier. Whether you make it on the stovetop, or in the Instant Pot. 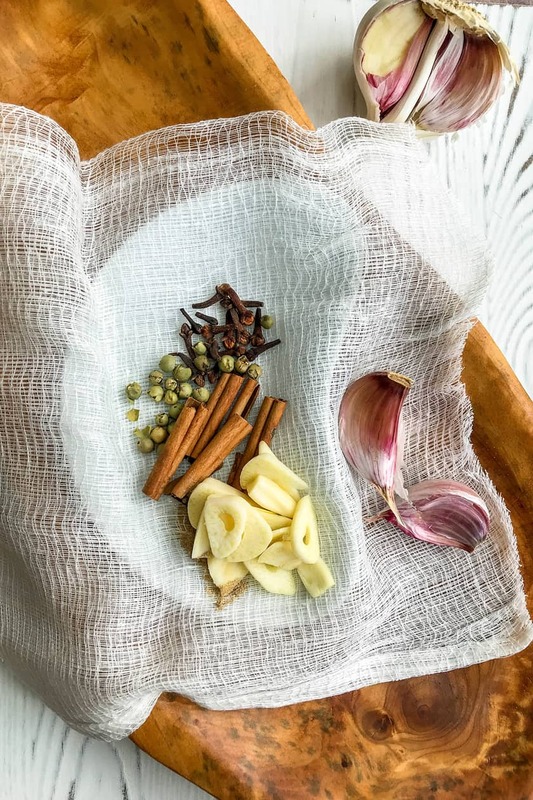 To make a bouquet garni, cut a piece of cheesecloth into a 4-inch square. Place the peppercorns, whole cloves, broken up cinnamon stick, sliced garlic and cardamom into the center of the cloth. Bring the edges of the cheesecloth together to form a small pouch. Tie a string around the top. On the saute function of the Instant Pot, melt the butter. Then add the onions and rice, cook until the onions have become translucent and soft. Then add the raisins, chopped apples, and bouquet garni spice pack. Pour the chicken broth over the rice and season with salt and pepper to taste. Lock the lid and set the Instant Pot to the manual setting to cook for 3 minutes. Allow the pressure to release naturally for 15 minutes before quick releasing any additional pressure. Stir in the green onions and toasted almonds; serve. Heat a large pot over medium heat, add the butter to melt. Then add the onions and the rice; stirring until the onions become translucent and soft. To the pot add the bouquet garni; slowly stir in the chicken broth, cover, and simmer 15 to 20 minutes or until almost all of the liquid has been absorbed. Add the raisins and apples; cover and cook another 5 minutes until all the liquid has been absorbed. 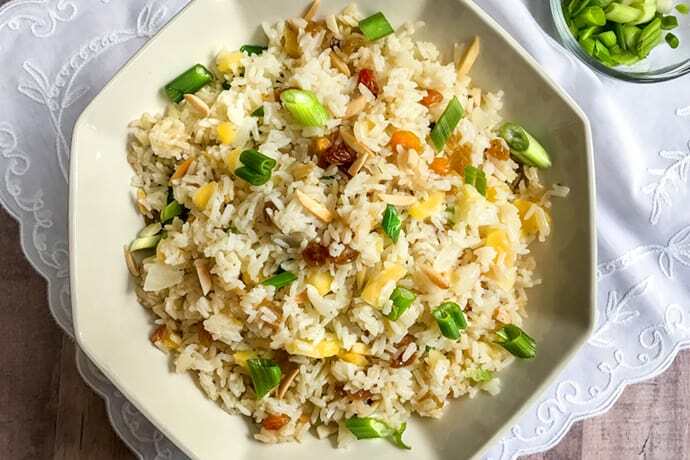 Stir in the almonds and green onions into the rice before serving. ** Recipe note: If you’re making this Fruited Rice Pilaf on the stovetop, increase the chicken broth to 4-1/2 cups. Always an anticipated dish on our Easter table. Sometimes, Christmas too. It’s fragrant with warm spices, soft and fruity, and crunchy with toasted almonds. It is a scrumptious favorite. On the saute function of the Instant Pot, melt the butter. Then add the onions and rice, cook until the onions have become translucent and soft. Then add the raisins, chopped apples, and bouquet garni spice pack. Stir the chicken broth into the rice mixture and season with salt and pepper to taste. Lock the lid and set the Instant Pot to the manual setting to cook for 3 minutes. Once cooked, allow the pressure to release naturally for 15 minutes before quick releasing any additional pressure. Stir in the green onions and toasted almonds; serve. Heat a large pot over medium heat, add the butter to melt. Then add the onions and the rice; stirring until the onions become translucent and soft. To the pot add the bouquet garni; slowly stir in the chicken broth (4-1/2 cups), cover, and simmer 15 to 20 minutes or until almost all of the liquid has been absorbed. Add the raisins and apples; cover and cook another 5 minutes until all the liquid has been absorbed. Stir in the almonds and green onions into the rice before serving. Hi Cindy! Wasn’t it just the best place?! I was pretty young but it certainly made a huge impression. My mom could spend hours there 😍! And because if it, I learned early to appreciate all those treasures. So glad there are some of us left that remember that fabulous place! 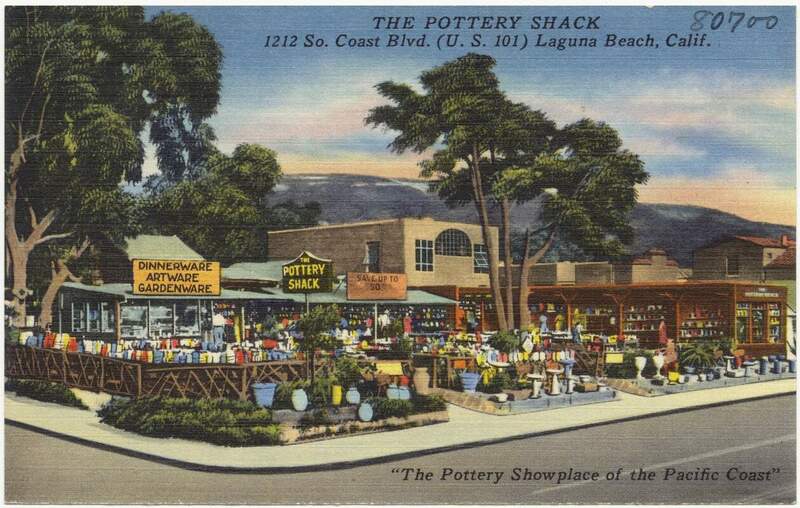 I always loved The Pottery Shack with all of the pottery attached to the outside walls. I also loved all the pottery, some hand made. The selection of table linens, napkins and accessories were unique and often one of a kind. What special memories. 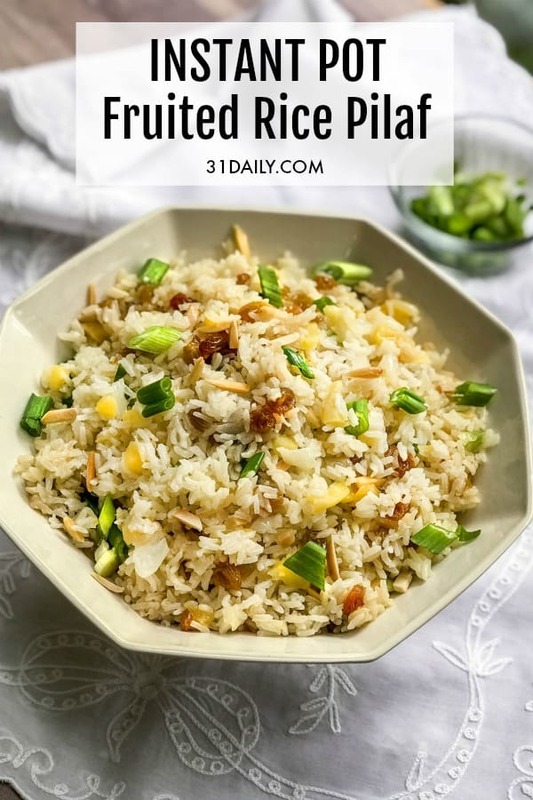 The fruited rice pilaf is one of my favorite dishes.